Located in the Zsigray Mansion, the sole surviving house of Bratislava’s former Judengasse (Jewish Street), the Museum of Jewish Culture is the only reminder of the historic Jewish neighborhood razed in the 1960s, when the SNP Bridge was constructed. The Baroque mansion from the 18th century was rebuilt in the 19th century and since 1993 has been the seat of the Museum’s permanent exhibition. 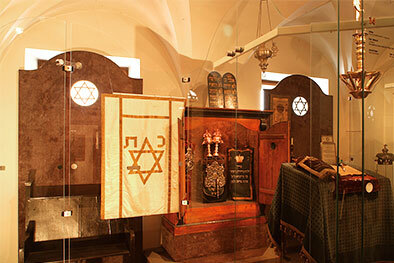 This precious architectural monument and the museum collection form part of the Slovak Jewish Heritage Route. The highlight of the museum collection are two valuable Chevra kadisha jugs from the Western Slovak town of Senica. Dating from 1734 and 1776, they belonged to the burial brotherhood that in a traditional Jewish community provided funerals to community members and assisted the bereaved. These two unique pieces, which depict scenes from Jewish burials and other activities of the brotherhood, were in 1999 reproduced on a joint Slovak-Israeli postage stamp.